Not all Tin Foil Hat podcast episodes will be posted, just the A+ or better shows. If you can't laugh at yourself then cry, cry until you die. Sam, pull my long raving rant out of your spam folder and read it! 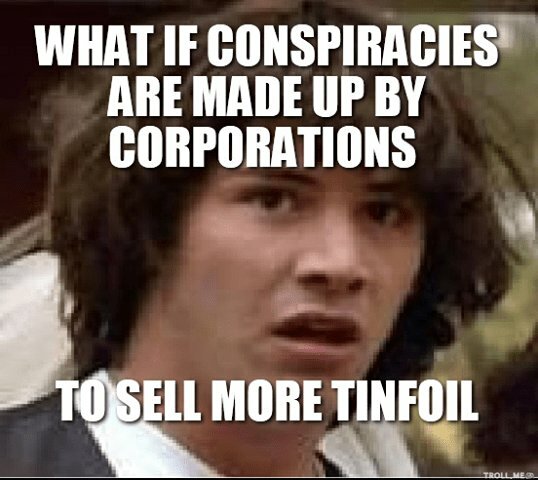 What if conspiracies are made up by corporations - to sell more tinfoil? The effectiveness of tinfoil against scalar waves has been known for over fifty years. For a similar long time campaigns are being led for disinformation by discrediting the fact in public awareness. The Russians officially tested their patented scalar weapons on "volunteers" last year. The effect on the central nervous system is not insignificant - the radiation has been shown to cause poor eyesight, numbness, severe depression, lack of concentration to loss of consciousness, sensory overreactions or failures, severe pain in the nerves and muscles, hysteria, panic and complete nervous breakdown. By the way, for almost thirty years, the aluminum content of commercially available tinfoil has been drastically reduced and no longer protects against scalar waves. Wow. Very good to know. Wished I'd posted this in /s/Radiation . That info would be good there with citations and links. For what it's worth, the 3 smart meters in the basement of this building I covered with aluminum foil, then hung an empty lasagna pan over each, then the lid of each over that. I have no idea if the lasagna came in tin or aluminum or silver. Somehow I suspect not silver. If they're working they're redirecting the waves back towards wall they're mounted on, and towards the neighbours across the road. If they're not working then they're just looking silly and collecting dust.